A few days ago, I was certain we were going to have to buy Renee a new computer. She has a 17-inch HP laptop we bought a little over two years ago. 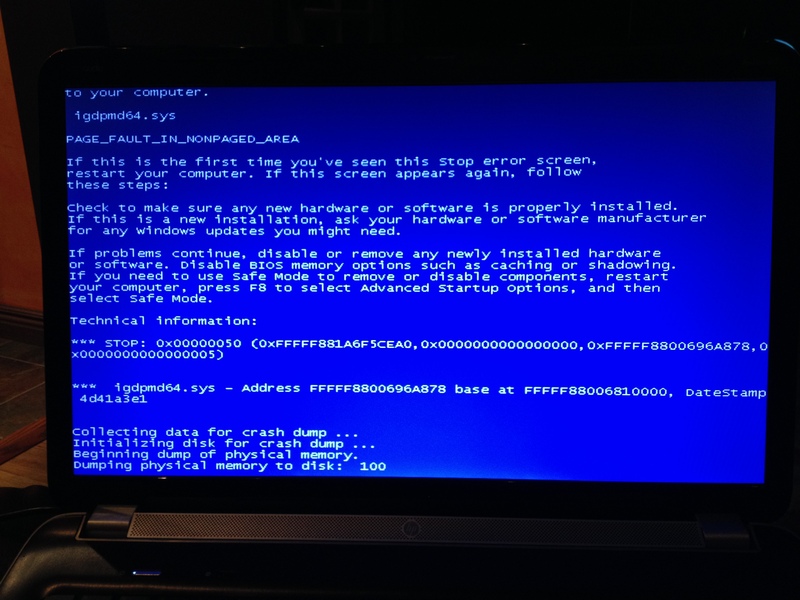 In the last week we started experiencing constant, sudden crashes with the famous “blue screen of death”. The first time it happened, I figured it was just a fluke, so we rebooted and tried to continue on. But something had obviously gone awry. Other things were wrong, like online videos on Yahoo that played the audio but wouldn’t show the video. The machine was unstable, throwing up the blue screen of death over and over. I did virus scans and ran “chkdsk” and the various “startup repair” tools built into the machine. Every time I thought it might be doing better, it would crash again. The thing about the “blue screen of death” is that it gives you lots of information but most of it looks meaningless and not at all useful. The messages suggested removing any recently installed hardware, but this was a laptop. We hadn’t added any new hardware. Why is it having a hardware problem? Is the original hardware getting ready to break? I just didn’t want to give up. So, on Sunday, I did a massive virus scan using the most aggressive settings I could find, just in case. It scanned both her computer and the wireless backup drive, so it took much of Sunday afternoon and overnight, but found no issues. So, no virus. Now what? 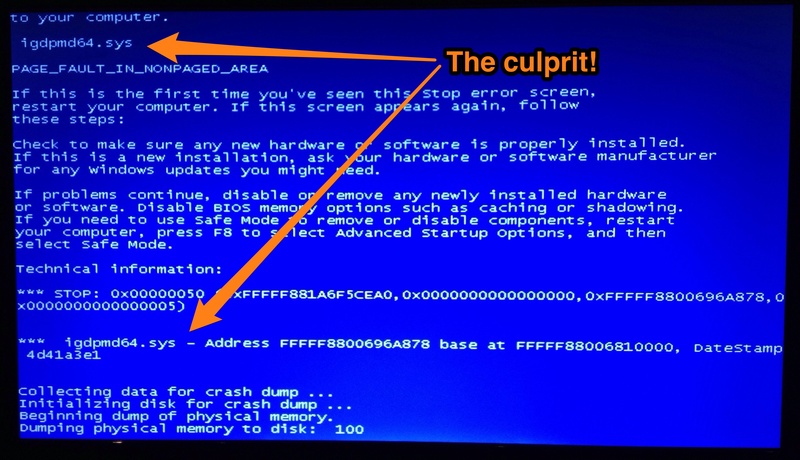 I decided to try a few Google searches on “blue screen of death” and found some useful articles about interpreting the “stop code” that occurred. So on the next crash, I wrote down a series of mysterious hexadecimal numbers and took a picture with my phone, just in case. Hmm. So I went back to that picture I took and found the file name igdpmd64.sys. (This is why I was glad I took a photo, because I had not written that part down). I searched on that file name and immediately found multiple pages and forum postings complaining about getting the “blue screen of death” after installing a particular Microsoft update. This one is fairly representative. Several of the pages even specifically mentioned HP laptops. So the problem boiled down to Microsoft update KB2670838. I checked her machine, and sure enough that update was installed back in October. I uninstalled the update, rebooted, opened Internet Explorer, and held my breath. I opened multiple tabs and started videos. They played correctly – both audio and video, and still, no crash. I kept the machine on the kitchen counter all day and fired up various tasks every time I walked past it, just to be sure. All good. I’m still amazed that the solution to something so frustrating ended up being so incredibly simple.